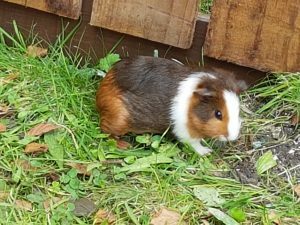 As part of our Animal Assisted Therapy programme, we introduced 4 lovely cuddly new residents to Byker Hall Care Home, in Newcastle. Here they all are, our Guinea Pigs: Frank, Harvey, Errol and Dexter! 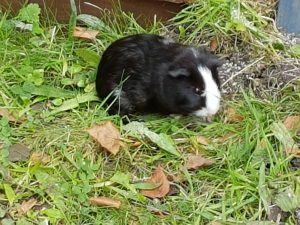 It has been found that people with chronic health problems and mental illness make significant progress when caring for animals. Symptoms of depression, hypertension and anxiety have been shown to be greatly alleviated. It is also proving to delay the onset of Dementia. 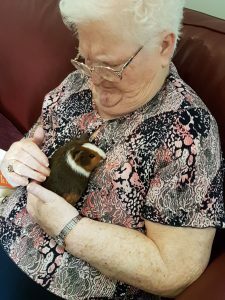 Animal Assisted Therapy allows residents to form a bond with an animal, to cuddle and stroke it. Stroking animals can bring down blood pressurecuddle and bond with our furry friends, which can help boost their mood, self-esteem and stop them feeling isolated. 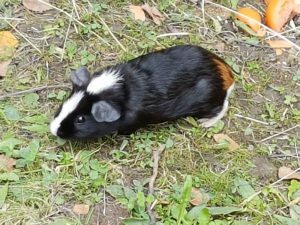 Guinea Pigs are ideal as they are easy-to-hold, compact and furry, with a cuddly personality and often quite chatty. 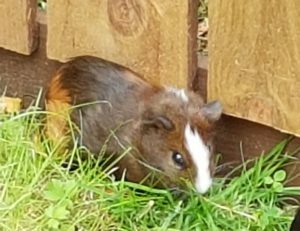 We will encourage residents to assist with taking care of the guinea pigs if they would like to and if they feel able. Dexter are, after all, a new part of the family at Byker Hall!